Background A defining characteristic of the human intestinal epithelium is that it is the most rapidly renewing tissue in the body. However, the processes underlying tissue renewal and the mechanisms that govern their coordination have proved difficult to study in the human gut. Objective To investigate the regulation of stem cell-driven tissue renewal by canonical Wnt and TGFβ/bone morphogenetic protein (BMP) pathways in the native human colonic epithelium. Design Intact human colonic crypts were isolated from mucosal tissue samples and placed into 3D culture conditions optimised for steady-state tissue renewal. High affinity mRNA in situ hybridisation and immunohistochemistry were complemented by functional genomic and bioimaging techniques. The effects of signalling pathway modulators on the status of intestinal stem cell biology, crypt cell proliferation, migration, differentiation and shedding were determined. Results Native human colonic crypts exhibited distinct activation profiles for canonical Wnt, TGFβ and BMP pathways. A population of intestinal LGR5/OLFM4-positive stem/progenitor cells were interspersed between goblet-like cells within the crypt-base. Exogenous and crypt cell-autonomous canonical Wnt signals supported homeostatic intestinal stem/progenitor cell proliferation and were antagonised by TGFβ or BMP pathway activation. 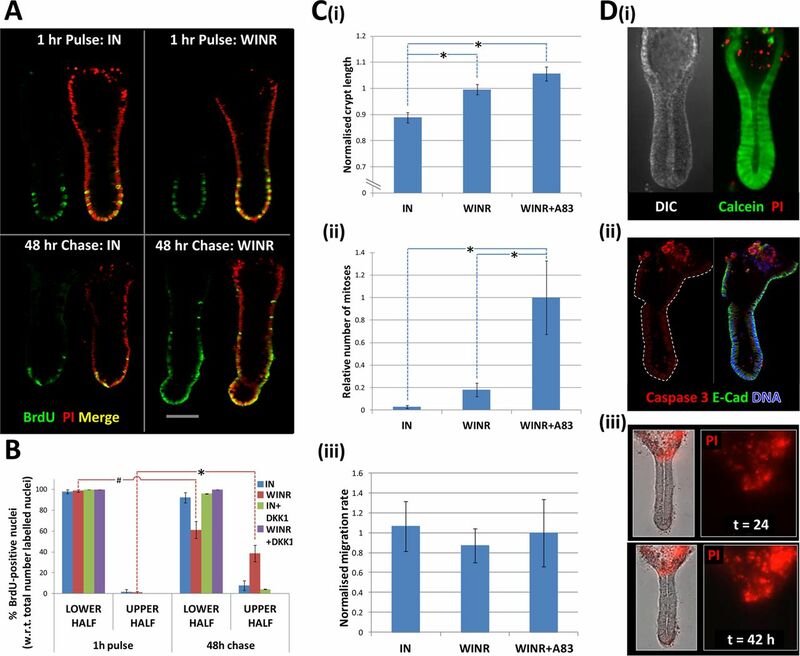 Reduced Wnt stimulation impeded crypt cell proliferation, but crypt cell migration and shedding from the crypt surface were unaffected and resulted in diminished crypts. Conclusions Steady-state tissue renewal in the native human colonic epithelium is dependent on canonical Wnt signals combined with suppressed TGFβ/BMP pathways. Stem/progenitor cell proliferation is uncoupled from crypt cell migration and shedding, and is required to constantly replenish the crypt cell population. In the mouse, renewal of the intestinal epithelium is regulated by signalling cross-talk between the Wnt, Notch, epidermal growth factor (EGF) and TGFβ/BMP pathways. Wnt signals predominate at the intestinal crypt-base and maintain intestinal stem cell biology. 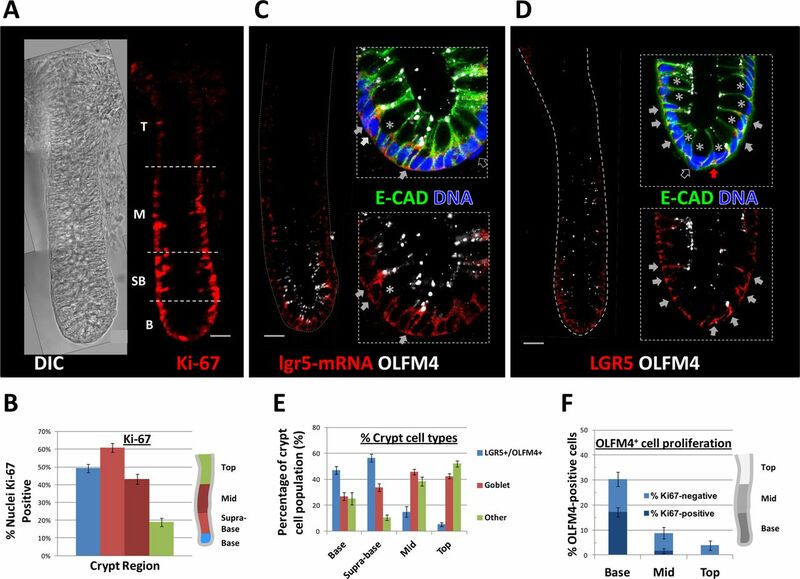 LGR5, a Wnt target gene, is a marker for mouse intestinal stem cells. 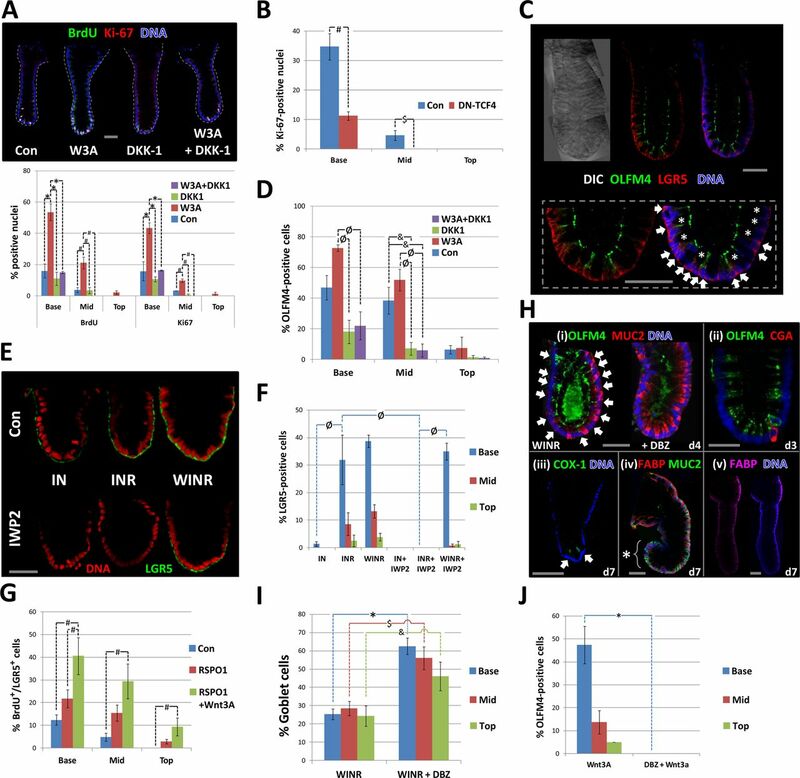 Wnt signals are required for the development of mouse intestinal organoids from single intestinal stem cells in culture. Additional pharmacological strategies have led to the development of spheroid and budding organoid systems for the long-term culture of human intestinal stem cells. Tissue renewal in the native human colonic epithelium can be studied in real time ex vivo. Wnt signals in combination with suppressed TGFβ/BMP pathways maintain the hierarchy and procession of tissue renewal along the human colonic crypt-axis. A population of proliferative LGR5/OLFM4-positive stem/progenitor cells are supported by Wnt signals at the crypt-base. We propose that crypt cell migration and shedding is the default state and that Wnt signals are required for steady-state tissue renewal. The native human colonic crypt culture model will permit functional interrogation of the status and mechanisms underlying tissue renewal in the healthy ageing human colonic epithelium and in tissue at risk of disease. The use of native human tissue will help the development and translation of novel strategies for the prevention of cancer and inflammatory bowel disease. Along with other self-renewing tissues such as skin and bone marrow, the mammalian gut epithelium is one of the most dynamic tissues in the body. The constant renewal cycle is of 5–7 days duration and takes place in a hostile environment characterised by the presence of bacterial toxins and metabolites, dietary antigens and mutagens, and immunological cytokines and oxidative stress. Approximately 10 billion cells are shed from the gut epithelium each day and these are continuously replaced by intestinal stem cell progeny. The colonic epithelium is exquisitely organised into millions of invaginations called crypts, each of which represents the self-renewing unit of the tissue. At the base of every crypt, it is thought that intestinal stem cells divide symmetrically to self-renew and undertake a progenitor phenotype on exiting the stem cell niche.1 ,2 Stem cell progeny (transit amplifying cells) proliferate, migrate and differentiate (into enterocytes, goblet cells, enteroendocrine cells and tuft cells) along the crypt-axis before they are shed from the surface epithelium. The hierarchy of tissue renewal is thought to minimise the accumulation of molecular damage by virtue of positioning long-lived stem cells in a relatively safe harbour at the crypt-base, from where they fuel the constant replenishment of shed cells. The molecular mechanisms that regulate the physiological processes of tissue renewal are of the utmost interest because they are disrupted in conditions such as inflammatory bowel disease and colon cancer. An analysis of gene expression patterns of normal human ‘colon tops and basal crypts’16 has detailed the topological expression of signalling pathway activators and inhibitors that are predicted to establish morphogenic gradients along the human colonic crypt-axis. Intriguingly, the respective activity of the Wnt signalling pathway at the crypt-base and the TGFβ/BMP pathway at the crypt-top is not thought not to be mutually exclusive. Reciprocal inhibition of the Wnt and TGFβ/BMP pathways appears to maintain the hierarchy and procession of tissue renewal along the crypt-axis. For example, genetic approaches in the mouse and analysis of human polyposis syndromes and colon cancer suggest that loss of TGFβ/ BMP pathway activation augments the Wnt signalling pathway, which disrupts tissue renewal and drives intestinal polyp/tumour formation.12 ,14 ,15 ,17–19 In keeping with this notion, tissue culture conditions that favour Wnt pathway activation and inhibition of the TGFβ/BMP pathways have permitted the expansion ad infinitum of mouse and human intestinal organoids ex vivo. Strikingly, single crypts derived from the human colon spawn multiple budding structures20 or expand into cyst-like spheroids,21 each composed predominantly of immature stem/progenitor cells that can be induced to differentiate by withdrawal of Wnt stimulation, or used for therapeutic transplantation.22 However, a detailed knowledge of the processes and signalling pathways involved in stem cell-driven tissue renewal in the human colonic epithelium is still lacking and is required to understand more fully the risk and pathogenesis of colorectal disease. We have developed a culture model of near-native human colonic crypts that preserves crypt length, topology, morphology and cellular polarity.23 Significantly, we now demonstrate that the hierarchy of stem cell-driven tissue renewal is recapitulated within this near-native human colonic crypt model ex vivo. Real-time imaging, gene reporter assays and dominant negative gene expression, in combination with subcellular immunolocalisation and in situ hybridisation, have been used to assess the status and mutual influence of Wnt and TGFβ/BMP signals on intestinal stem cell biology, proliferation, differentiation, migration and cell shedding in near-native human colonic crypts. This study was performed in accordance with approval from the East of England National Research Ethics Committee (LREC 97/124). Colorectal tissue samples were obtained with informed consent at rectosigmoid endoscopy from the sigmoid colon of 52 patients (51–83 years old) exhibiting no apparent intestinal pathology and from the normal mucosa (ie, >10 cm tumour margin) of 30 patients undergoing anterior resection (44–85 years old). Biopsy tissue samples or surgical mucosal specimens were immediately fixed with 4% paraformaldehyde for 1 h and placed in phosphate-buffered saline. Single microdissected crypts were embedded in Matrigel, postfixed with 4% paraformaldehyde and processed for immunohistochemistry (see online supplementary methods). Colonic crypts were isolated as described previously,23 ,24 embedded in Matrigel and placed into culture conditions that were similar to those described recently for intestinal organoids20 and spheroids.20 ,21 See online supplementary methods for details. BrdU (10 μM) was added to the experimental crypt culture media as described to monitor crypt cell proliferation and migration. When required, freshly isolated colonic crypts were transduced with the lentiviral TOP-green fluorescence protein (GFP) Wnt reporter (HIV-based, VSV-G; SABiosciences) or adenoviral CMV-DN-TCF4 (type 5, dE1E3; Vector Biolabs) at a multiplicity of infection of 250 TU/crypt cell. Transduction with lentiviral or adenoviral CMV-GFP was used as a positive control to monitor infection efficiency. Colonic crypts cultured in 12 well plates were placed on the climate-controlled (37°C, 5% CO2) stage of a Nikon or Zeiss inverted motorised time-lapse system. Following embedding in Matrigel, microdissected-native crypts or cultured crypts were processed for immunohistochemistry or dual mRNA in situ hybridisation/immunohistochemistry. Immmunolabelling was visualised by using an appropriate combination of species-specific Alexafluor-conjugated secondary antibodies (Invitrogen). See online supplementary methods for details. Expression of marker genes for stem cells, differentiated crypt cell types and signalling pathway components was determined in freshly isolated and cultured crypts using quantitative or standard reverse transcriptase polymerase chain reaction (RT-PCR) techniques. See online supplementary methods for details. Following in situ hybridisation and/or immunohistochemistry, whole-mounted microdissected (ie, native) and cultured crypts were visualised by laser scanning confocal microscopy (Zeiss 510 META). A ×63 (1.4 numerical aperture) objective was used to obtain confocal images of the longitudinal crypt-axis. Image stacks were taken at 1–3 μm intervals which allowed selection of precise focal planes. The same acquisition parameters were used prior to post-hoc comparison of immunolabelling fluorescence intensity. The crypt hierarchy was divided into three regions along the crypt-axis, each containing an equal number of nuclei and designated base, mid and top. In some cases, the base was subdivided into two regions of equivalent cell number, termed base and suprabase. The percentage number of cells (or nuclei) positive for a specific marker (eg, Ki67, LGR5), or the relative immunofluorescence intensity (eg, nuclear axin 2), was quantified (ImageJ, NIH) and expressed for each region; these values were either absolute or relative to the corresponding crypt-base value. Three dimensional images were rendered in Volocity (Improvision). Data are expressed as means±SEM (n is the number of crypts derived from N patients). Differences between groups were determined using one-way analysis of variance (ANOVA) and Tukey's post-hoc method of multiple comparisons. Correlation between two variables was determined by the Spearman Rank test and independent association between variables was determined by the Chi Squared test. The level of significance (p value) is indicated in all cases. Hierarchy of stem/progenitor cell proliferation along the native human colonic crypt-axis. (A) Classical profile for Ki-67 immunolabelling (red) of microdissected (ie, native) human colonic crypts; B-base, SB supra-base, M-mid, T-top. (B) Ki67-positive cell nuclei predominate at the crypt-base and the mid-crypt region (N=13 subjects, n=58 crypts). (C) Dual in situ hybridisation and immunolabelling of lgr5-mRNA (red) and OLFM4 protein (white) identifies a population of lgr5-mRNA+/OLFM4+cells at the base of native human colonic crypts; E-CAD (green) demarks crypt cell membranes; filled white arrows indicate cells exhibiting intense fluorescent labelling for lgr5-mRNA and OLFM4; open arrow denotes nucleus of pericryptal myofibroblast; asterisk signifies a goblet cell with nucleus in the confocal image plane; scale bar—30 mm. (D) Double immunolabelling of LGR5 protein (red) and OLFM4 (white) confirms congruent expression of both intestinal stem cell markers by individual crypt cells within the crypt-base; annotations as above; see online supplementary figure S1 for schematic representation. (E) Quantification of cell types according to stem cell marker expression and cell morphology along the crypt-axis (see online supplementary figure S1 for an example, of lgr5-mRNA/MUC-2 double labelling); the congruence of OLFM4 and either lgr5-mRNA or LGR5 protein expression was 96%±4% (mean±SD, n=20 microdissected crypts from N=4 subjects). (F) Analysis of crypt stem/progenitor cell proliferation (n=10 crypts from N=5 subjects; see online supplementary figure S1 for a crypt image of double OLFM4/Ki-67 immunolabelling). Arrows indicate examples of intense labelling for lgr5+/OLFM4+ stem cells. *Denotes an example of a goblet cell with nucleus in plane of focus. DIC, differential interference contrast; E-CAD, E-cadherin. An insight into the cellular signals that govern human intestinal tissue renewal was gained by spatially correlating signalling pathway activation along the hierarchy of the crypt-axis. Nuclear β-catenin, a hallmark of the canonical Wnt signalling pathway activation, and nuclear axin-2, a Wnt target gene, predominated at the crypt-base and exhibited an immunofluorescence intensity gradient that diminished along the crypt-axis (figure 2A,B). A high degree of congruence at the crypt-base was also exhibited by β-catenin and c-myc (another Wnt target gene) (see online supplementary figure S1D). Conversely, nuclear phospho-SMAD 2/3 immunofluorescence, an indicator of TGFβ pathway activation, peaked in the mid-crypt region (figure 2C), whereas nuclear phospho-SMAD 1/5/8 immunofluorescence, an indicator of BMP pathway activation, exhibited a retrogradient that was more intense at the crypt-opening (figure 2D). In accordance with similar observations made largely of the mouse intestine,5–7 ,12 ,13 ,26 these findings suggested that active Wnt signals support human colonic crypt stem/progenitor cell proliferation and that TGFβ/BMP pathway activation may favour cell cycle withdrawal. 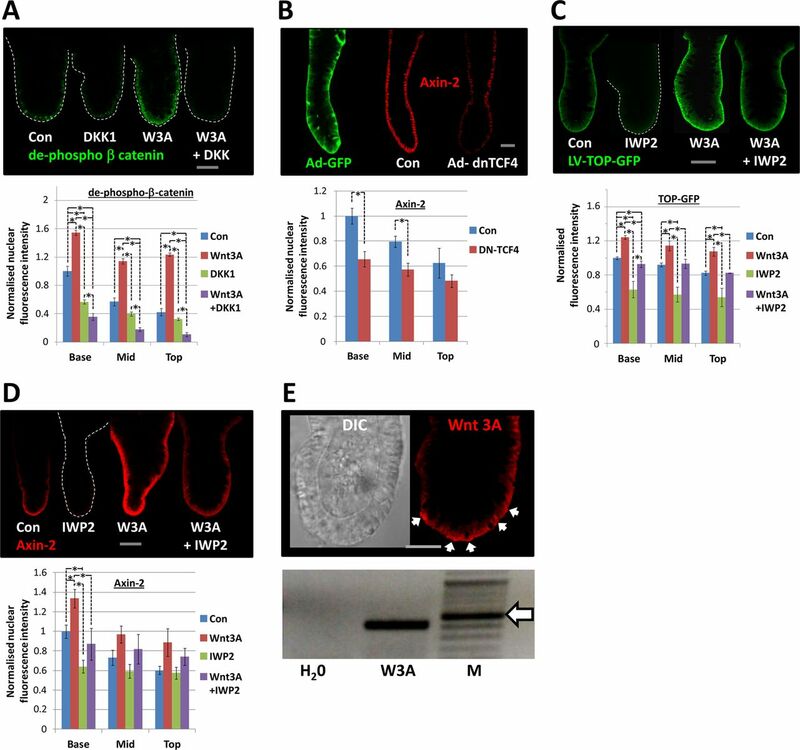 Wnt/β catenin and SMAD signalling profiles along the native human colonic crypt-axis. (Ai) Immunolabelling of total β catenin performed on native human colonic crypts reveals intense membrane and nuclear localisation at the colonic crypt-base. (Aii) The fluorescence intensity of nuclear β catenin predominates at the crypt-base and diminishes progressively towards the top of the crypt (Spearman Rank, r=−0.47, p<0.001). (B) A similar gradient exists for the immunofluorescence intensity of nuclear Axin-2 labelling (r=−0.48, p<0.001). Conversely, the immunofluorescence for nuclear phospho-SMAD 2,3 (C) predominates in the mid-crypt region, while nuclear phospho-SMAD 1,5,8 (D) exhibits a retrogradient that is more intense at the crypt opening (r=0.84, p<0.04). All values in each bar chart were normalised to the intensity value at the crypt-base. For each antibody, data were collated from n≥10 crypts microdissected from N≥3 patients. Filled arrowheads indicate intense nuclear labelling; open arrowheads mark nuclei of lower fluorescence intensity. A combination of Wnt pathway activators and TGFβ/BMP pathway inhibitors is required for maintenance of cultured human colonic crypts ex vivo (A) Overview of human colonic crypts cultured within a Matrigel droplet under optimised conditions described in panel D; the bright field image was created by stitching together an array of 12 adjacent fields of view taken with a ×4 objective lens; scale bar=0.5 mm. (B) Enlargement of insert depicted in (A) representing a typical field of view (×4 objective lens); example crypt-base and shedding domains are denoted by open and closed arrowheads, respectively; *dead crypt fragments; scale bar=0.5 mm. (C) Example paired differential interference contrast images (×20 objective) of human colonic crypts cultured under optimised conditions for 0–4 and 0–7 days; d1=day 1, d4=day 4, d7=day 7; scale bar=100 μm. (D) Quantification of crypt length at day 4 or day 7 (with respect to the initial crypt length 4 h post-isolation, Day 0) following culture in the presence of the indicated combination of recombinant human growth factors, recombinant human BMP binding protein and/or small molecule ALK 4/5/7 inhibitor: IGF-1 (50 ng/mL), Gremlin-1 (200 ng/mL), Noggin (100 ng/mL), Wnt3A (100 ng/mL), R-Spondin-1 (500 ng/mL), A83-01 (0.5 μM); n≥6 crypts derived from N≥3 subjects. To determine activation of the canonical Wnt signalling pathway, human colonic crypts were treated with Wnt-3A in the presence or absence of DKK-1. Wnt-3A stimulated translocation of nuclear de-phospho-β-catenin and this was inhibited by DKK-1 (figure 4A). Wnt-3A treatment also induced nuclear accumulation of the Wnt target gene Axin-2, which was inhibited by transduction of crypts with an adenoviral vector carrying a dominant negative TCF4 mutant (figure 4B). Exogenous Wnt-3A also stimulated TOP-GFP intensity confirming activation of Wnt target gene transcription (figure 4C). Treatment of crypts with an inhibitor of Wnt production, IWP2 (2 μM), suppressed basal TOP-GFP expression (figure 4C) and basal levels of nuclear axin-2 (figure 4D), both of which were rescued by addition of exogenous Wnt-3A. Wnt-3A mRNA was found to be expressed in freshly isolated crypts by RT-PCR and Wnt-3A ligand was immunolocalised to the stem cell region at the human colonic crypt-base (figure 4E). Exogenous and crypt-autonomous Wnt ligand promotes canonical Wnt/β catenin signals in cultured human colonic crypts. (A) Confocal images of dephospho β catenin immunolabelling following treatment with exogenous Wnt-3A (100 ng/mL, 30 min), in the presence or absence of Dikkopf-1 (DKK-1; 800 ng/mL); bar chart illustrates image analysis of nuclear immunofluorescence intensity. (B) Visualisation and analysis of nuclear Axin-2 3 days post-transduction with adenoviral GFP (Control: green Ad-GFP; red—Axin2) or dominant negative-TCF4. Effects of IWP2 (2 μM) on lentiviral (LV)-TOP-GFP expression (C) and nuclear axin-2 (D) immunofluorescence following 3 days culture. (E) Immunolabelling of human Wnt-3A (arrows indicate intense labelling basal membranes) and expression of Wnt-3A mRNA by RT-PCR using cDNA from freshly isolated human colonic crypts; expected Wnt 3A PCR product is 404 bp and the arrow denotes a 500 bp marker. All values in (A)–(D) bar charts were normalised to the control value in the crypt-base region. Control media: for A, C and D=IGF-1 (50 ng/mL)/Noggin (100 ng/mL)/R-spondin-1 (500 ng/mL); Wnt-3A (100 ng/mL) where indicated; for B=IGF-1 (50 ng/mL)/Noggin (100 ng/mL)/R-spondin-1 (500 ng/mL)/Wnt-3A (100 ng/mL). Statistical significance assessed by ANOVA followed by Tukey's post-hoc analysis; significant differences between pairs of mean values are indicated by linked dashed lines, *p<0.01; n≥4 crypts for each experimental group and the data are representative of at least three independent experiments in each case. 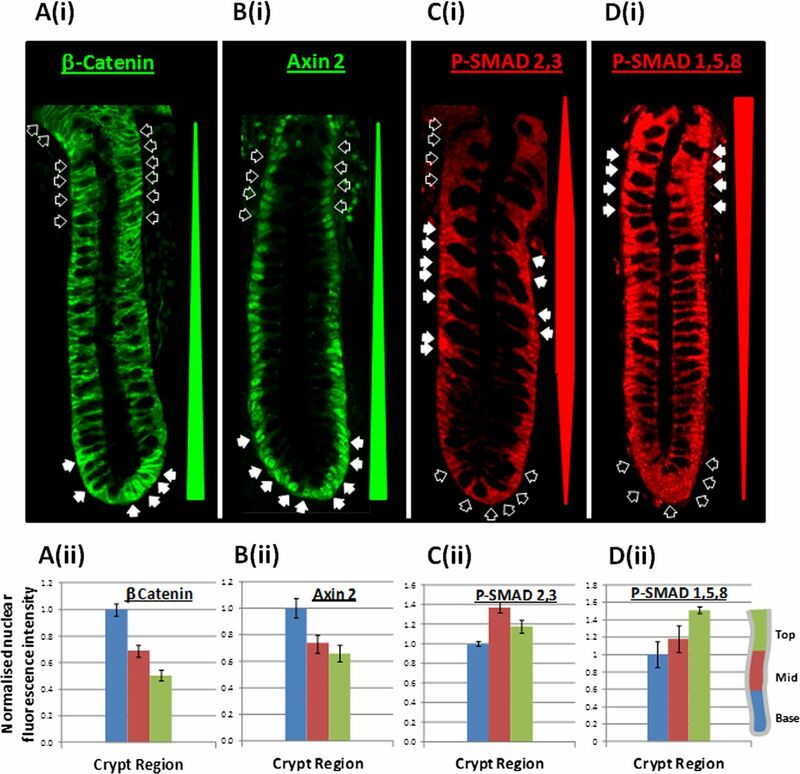 TGFβ and BMP signalling pathway status in cultured human colonic crypts was assessed by phospho-SMAD immunofluorescence. 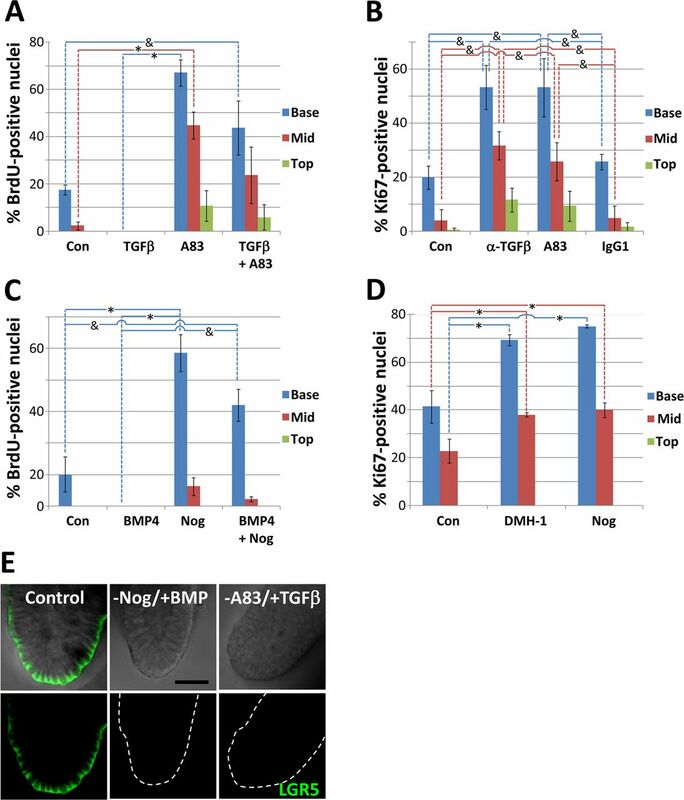 A83–01 suppressed the TGFβ-induced increase in nuclear phospho-SMAD 2,3 levels (figure 5A), while noggin inhibited BMP stimulation of nuclear phospho-SMAD 1,5,8 levels (figure 5B). TGFβ and BMP inhibited the levels of nuclear axin-2, which was rescued by A83-01 (figure 5C) and noggin (figure 5D), respectively. It is noteworthy that A83-01 and noggin also augmented nuclear axin-2 levels in the absence of exogenous TGFβ or BMP ligand (figure 5C,D). These studies demonstrate that the Wnt signalling pathway in human colonic crypts is suppressed by TGFβ or BMP pathway activation. However, under optimal culture conditions, that is, Wnt stimulation in conjunction with BMP/ TGFβ suppression, the axin-2, p-SMAD 2,3 and p-SMAD 1,5,8 signalling gradients observed along the native human colonic crypt-axis (figure 2) were maintained ex vivo (see online supplementary figure S7). Also, analysis of marker genes for stem cells and differentiated crypt cell types indicated that the relative levels of gene expression in native crypts were similar to those placed in culture (see online supplementary figure S8). Taken together, these observations provided a good basis on which to investigate the relative influence of Wnt, BMP and TGFβ signalling pathways on human colonic crypt cell renewal. TGFβ and BMP pathway activation inhibits canonical Wnt signalling along the cultured human colonic crypt-axis. (A) Confocal images of phospho-SMAD2,3 immunolabelling following treatment with TGFβ (20 ng/mL, 2 days), in the presence or absence of A83-01 (0.5 μM); bar chart illustrates image analysis of nuclear immunofluorescence intensity. (B) Effects of BMP (100 ng/mL, 2 days) and/or noggin (100 ng/mL) on nuclear phospho-SMAD1,5,8 immunofluorescence intensity levels. 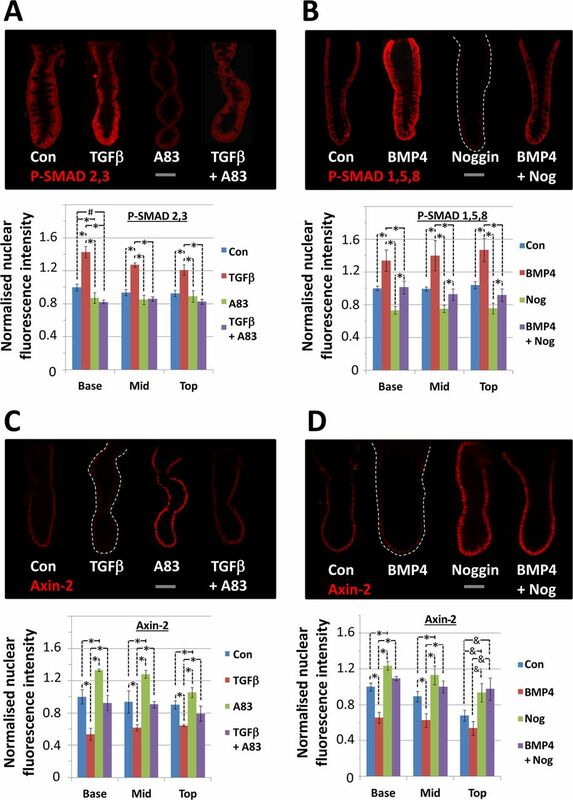 (C) TGFβ and (D) BMP suppression of nuclear Axin-2 immunofluorescence, and rescue by pretreatment with noggin or A83-01, respectively. All values in (A–D) were normalised to the control value in the crypt-base region. Culture conditions: (A and C)—IGF-1 (50 ng/mL)/R-spondin-1 (500 ng/mL)/Wnt-3A (100 ng/mL)/Noggin(100 ng/mL) and TGFβ (20 ng/mL) and/or A83-01 (0.5 μM) where indicated; (B and D)—IGF-1 (50 ng/mL)/R-spondin-1 (500 ng/mL)/Wnt 3A (100 ng/mL)/A83-01 (0.5 μM) and BMP (100 ng/mL) and/or noggin (100 ng/mL) where indicated. Significant differences were assessed by ANOVA followed by Tukey's post-hoc analysis; significant differences between pairs of mean values are indicated by linked dashed lines; #p<0.01, *p<0.02, &p<0.05; n≥4 crypts for each experimental group and the data are representative of at least three independent experiments in each case. Scale bars=75 μm. Inspection of bright-field time-lapse movies (see online supplementary movies S2 and S3) revealed regular movements of cell nuclei and membranes in the proliferative zone of the crypt that were evocative of crypt cell mitoses. Accordingly, Wnt signals stimulated BrdU uptake and Ki67 labelling of cells located in the lower-half of human colonic crypts ex vivo (figure 6A,B). Inhibitors of Wnt signal transduction (DKK-1) and Wnt target gene activation (DN-TCF4 expression) abrogated Wnt-stimulation of human colonic crypt cell proliferation (figure 6A,B). Significantly, a population of LGR5+/OLFM4+ slender cells were interspersed between goblet-like cells within the cultured colonic crypt-base (figure 6C) in similar numbers found in the native crypt (cf. figures 1E and 6D,E). OLFM4 expression was inhibited by DKK-1 (figure 6D), as was LGR5-mRNA (not shown). An inhibitor of Wnt ligand secretion, IWP2, suppressed basal levels of LGR5 immunofluorescence and this was rescued by exogenous Wnt-3A (figure 6E,F); exogenous Wnt-3A also increased stem cell proliferation along the crypt-axis (figure 6G). Canonical Wnt signals maintain cultured human colonic crypt stem/progenitor cell proliferation. (A) Effects of exogenous Wnt-3A (100 ng/mL) and/or DKK-1 (800 ng/mL) on nuclear BrdU uptake and Ki67 labelling after 3 days culture. (B) Dominant-negative TCF4 abrogates crypt cell proliferation 3 days post-transduction. (C) Coexpression of OLFM4 and LGR5 by a population of slender cells (arrowheads) interspersed between goblet-like cells (asterisk) located at the base of human colonic crypts cultured for 4 days. (D) The relative effects of Wnt-3A (100 ng/mL) and DKK-1 (800 ng/mL) on the percentage of OLFM4-positive cells following 3 days in culture. (E) Confocal images and (F) image analysis of LGR5 immunolabelling following 4 days in culture: suppression by IWP2 (2 μM) and rescue by exogeneous Wnt-3A (100 ng/mL). (G) Wnt pathway activators promote BrdU incorporation into the nuclei of LGR5-positive colonic crypt cells. (H) Immunolabelling of differentiated cell types in cultured colonic crypts: distinct labelling of cells positive for (i) MUC-2 or OLFM4 (arrows), (ii) chromogrannin A or OLFM4, and (iii) COX-1; all shown at the base of human colonic crypts; (iv, v) intense FABP1 labelling at the crypt opening (asterisk and bracket indicate crypt-base). The effects of the Notch inhibitor, DBZ (1 mM) on goblet cell number and OLFM4-positive cell number illustrated in (H) are quantified in (I and J), respectively. Significant differences were assessed by ANOVA followed by Tukey's post-hoc analysis; significant differences between pairs of mean values are indicated by linked dashed lines; *p<0.001, $p<0.002, øp<0.02, #p<0.01, &p<0.05. Scale bars=50 μm. Control media: I=IGF-1 (50 ng/mL), N=Noggin (100 ng/mL), R=R-spondin-1 (500 ng/mL), A83-01 (0.5 μM); W3A or W=Wnt-3A (100 ng/mL), DKK-1 (Dikkopf-1; 800 ng/mL) and DBZ=dibenzazepine (1 mM) where indicated. The observations described thus far demonstrate that Wnt signals are prominent at the base of human colonic crypts and support intestinal stem cell biology and crypt cell proliferation. Given that TGFβ and BMP signals suppress Wnt signals (figure 5), it followed that they would also inhibit crypt cell proliferation. Accordingly, BrdU uptake was suppressed by omission of the BMP inhibitor noggin or the TGFβ inhibitor A83-01 (figure 7A,C). Exogenous BMP or TGFβ abolished BrdU uptake, which was rescued by noggin or A83-01, respectively (figure 7A,C). A neutralising pan-specific TGFβ antibody mimicked the effects of A83-01 (figure 7B) and a specific small molecule inhibitor of BMPR2/ALK2, DMH-1, reproduced the effect of noggin (figure 7D). In addition, activation of the BMP or TGFβ pathway abolished LGR5 expression (figure 7E). Activation of TGFβ or BMP pathways suppress cultured human colonic crypt stem/progenitor cell proliferation. (A) Effects of treatment with TGFβ (20 ng/mL, 2 days) and/or the ALK4/5/7 inhibitior A83-01 (0.5 μM) on nuclear incorporation of BrdU incorporation into human colonic crypt cells. (B) A pan-specific monoclonal TGFβ antibody (10 μg/mL) mimicks the effects of A83-01 (0.5 μM) on crypt cell proliferation; the irrelevant monoclonal anti-COX2 (10 μg/mL) was included as an IgG1 control. (C) BMP (100 ng/mL) abolishes human colonic crypt cell proliferation. Noggin (100 ng/mL) promotes crypt cell proliferation and prevents the inhibitory effects of BMP4. (D) The BMPR1 (ALK2/3) inhibitor DMH-1 (1 μM) mimics the stimulatory effects of noggin on crypt cell proliferation. (E) BMP pathway or TGFβ pathway activation suppress LGR5 immunolabelling. Significant differences were assessed by ANOVA followed by Tukey's post-hoc analysis; significant differences between pairs of mean values are indicated by linked dashed lines; *p<0.001, &p<0.05; n≥4 crypts for each experimental group and the data are representative of at least three independent experiments in each case. Control media: (A and B) W/I/N/R; (C and D) W/I/R/A83-01; (E) W/I/N/R/A83-01. W=Wnt 3A, I=IGF-1, ‘N’ or ‘Nog’=noggin, R=R-spondin-1. The relative upward movement of crypt cells along the crypt-axis from the crypt-base was demonstrated by a classical BrdU pulse-chase approach (figure 8A). Inhibition of Wnt signalling with DKK-1 blocked the upward movement of BrdU pulse-labelled cells in the lower half of the crypt-axis into the upper-half of the crypt-axis (figure 8B). 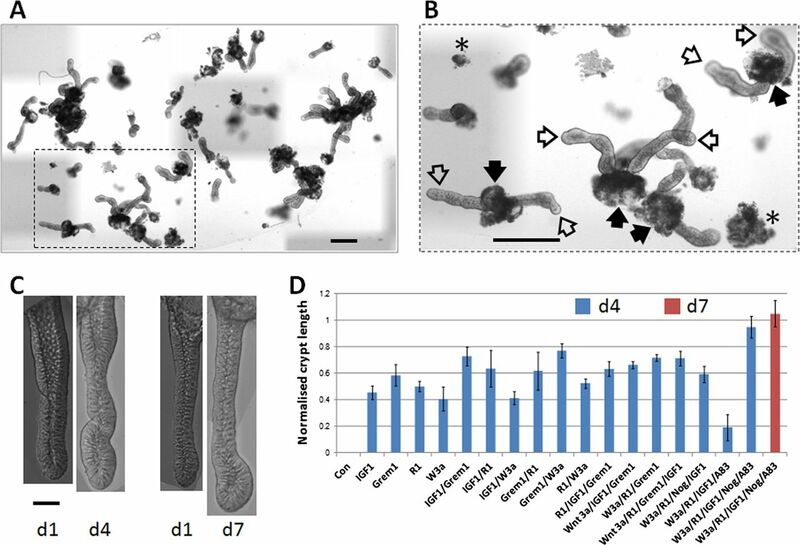 In addition to this relative migration of cells within the crypt frame of reference, absolute cell migration was also observed when crypts were cultured under suboptimal culture conditions (ie, reduced Wnt stimulation). Absolute crypt cell migration was associated with shortening of the crypt length (eg, see online supplementary figure S5), whereby the crypt-base migrated towards the crypt opening and crypt cells were shed from the surface (figure 8D). To explore the link between crypt cell proliferation and migration, crypts were cultured under conditions that imposed different levels of proliferation and were observed under time-lapse microscopy. Crypt length (figure 8Ci) and crypt cell proliferation followed a similar decreasing trend under culture conditions endowed with less proliferative potential (cf. figure 8Ci,Cii), but crypt cell migration rate stayed constant (figure 8Ciii). The average migration rate for crypts exhibiting a steady state length was 4.95±0.45 μm/h (n=20 crypts, N=4 patients). Cell shedding was localised to the upper crypt region as revealed by labelling of ‘live’ cultured crypts incubated with live/dead fluorophores, that is, calcein/propidium iodide (figure 8Di) and by immunolabelling fixed crypts for activated-caspase-3 (figure 8Dii). The accumulation of shed cells at the crypt opening was monitored in real time by observing discrete, intense bursts of red fluorescence associated with propidium iodide binding to cell nuclei following membrane rupture (figure 8Ciii and online supplementary movie S4). Thus, under these conditions, crypt cell proliferation in the lower half of the crypt is required to maintain a steady-state crypt cell population (eg, constant crypt length) by replenishing cells shed from the upper surface, but does not appear to drive (ie, mitotic pressure) crypt cell migration per se. Crypt cell migration and shedding complete tissue renewal ex vivo. (A) A BrdU pulse-chase experiment demonstrating the relative upward migration of cells from the crypt-base along the crypt-axis in the absence (IGF-1, 50 ng/mL and Noggin, 100 ng/mL) or presence of Wnt stimulation (Wnt-3A, 100 ng/mL and R-spondin-1, 500 ng/mL); for each condition, images are shown 1 h following the BrdU pulse and 2 days after the ‘cold’ chase. (B) Analysis of BrdU pulse-chase images illustrating the respective decrease and increase in BrdU-positive crypt cells in the lower and upper half of the crypt in the presence of Wnt stimulation. (C) Analysis of time-lapse data acquired during days 2–3 in culture under different degrees of Wnt and TGFβ signalling pathway activation; relative changes in crypt length (Ci) and crypt cell mitoses (Cii) versus constant crypt cell migration (Ciii) are illustrated. (Di) hierarchy of calcein-labelled live cells and propidium iodide (PI)-positive dead cells; (Dii) cells at the crypt opening are positive for activated caspase 3 and (Diii) the number of PI-positive shed cells increases over time in culture (see online supplementary movie S4). Significant differences were assessed by ANOVA followed by Tukey's post-hoc analysis; significant differences between pairs of mean values are indicated by linked dashed lines; *p<0.01. W=Wnt 3A, I=IGF-1, N=noggin, R=R-spondin-1, DKK-1=dikkopf-1. Intestinal tissue renewal is fundamental to long life and lifelong health. The processes by which the intestinal epithelium renews itself have been well described in the mouse, but the molecular and cellular mechanisms that govern tissue renewal in the human gut are less well understood. Central to gaining a more detailed understanding is the development of model systems for the native human intestinal epithelium. Ideally, these should recapitulate the processes of tissue renewal in health and disease. Another desirable requirement is that ex vivo human tissue models are amenable to bioimaging and functional genomic approaches. Complementary to the recent development of intestinal organoid culture systems, we have developed a culture model of near-native human colonic crypts. Presently, we have demonstrated a requirement for canonical Wnt signals and suppressed TGFβ/BMP pathways to support intestinal stem cell-driven tissue renewal in the human colon. Non-repressed TGFβ/BMP signals inhibited the canonical Wnt signalling pathway, intestinal stem cell marker expression and crypt cell proliferation, while unabated crypt cell migration and shedding resulted in the appearance of drastically shortened crypts and a compromised crypt cell population. Exogenous Wnt ligand was required for human colonic crypt culture. Maintenance of a Wnt signalling gradient sustained the hierarchy of tissue renewal for at least 7 days. However, in the first few days of culture in the absence of exogenous Wnt ligand, crypts exhibited basal levels of Wnt signal activation, stem cell marker expression and cell proliferation. These traits were abolished by IWP2, an inhibitor of Wnt ligand secretion.38 In support of crypt cell-autonomous secretion of Wnt ligand, isolated crypts expressed Wnt 3A mRNA and immunolabelling for Wnt 3A identified positive cells within the stem cell niche at the crypt-base. However, in contrast to mouse Paneth cells (a source of Wnt ligand for neighbouring small intestinal stem cells) mouse colonic crypts do not express Wnt ligand and would appear to be completely reliant on Wnt stimulation from subepithelial sources.39 The present observations in human colonic crypts point to a key role for the colonic crypt Wnt signalling gradient in regulating intestinal stem cell status and tissue renewal. Wnt signalling status varies along the longitudinal gut-axis40 and is thought to be subject to epigenetic modulation in relation to ageing and cancer.41 ,42 Disruption of the colonic crypt Wnt signalling gradient would be expected to impact on crypt renewal homeostasis and influence disease risk. In fact, higher concentrations of Wnt 3A ligand caused mass expansion of intestinal stem/progenitor cells along the crypt-axis (not shown) and we are currently investigating the consequences to crypt cell renewal and the relevance to disease onset. In summary, we have developed a near-native human colonic crypt culture model. The functional interaction between morphogens and their relative influence of stem cell-driven tissue renewal reinforces the importance of the canonical Wnt signalling pathway. Future investigation of the modulators that establish morphogen gradients along the crypt-axis16 and their influence on the efficiency of intestinal tissue renewal in health and disease promises novel insights into disease risk and prevention. The native colonic crypt model can also be used to investigate numerous other aspects of (patho)physiology including: membrane transport, microbial-epithelial interactions, mesenchymal-epithelial cell interactions, pharmacology and toxicology, in homeostasis and disease.
. Intestinal crypt homeostasis results from neutral competition between symmetrically dividing Lgr5 stem cells. Cell 2010;143:134–44.
. Intestinal stem cell replacement follows a pattern of neutral drift. Science 2010;330:822–5. et al. Current view: intestinal stem cells and signaling. Gastroenterology 2008;134:849–64.
. Stem cells, self-renewal, and differentiation in the intestinal epithelium. Annu Rev Physiol 2009;71:241–60. et al. The beta-catenin/TCF-4 complex imposes a crypt progenitor phenotype on colorectal cancer cells. Cell 2002;111:241–50. et al. Essential requirement for Wnt signaling in proliferation of adult small intestine and colon revealed by adenoviral expression of Dickkopf-1. Proc Natl Acad Sci USA 2004;101:266–71. et al. Canonical Wnt signals are essential for homeostasis of the intestinal epithelium. Genes Dev 2003;17:1709–13. et al. Identification of stem cells in small intestine and colon by marker gene Lgr5. Nature 2007;449:1003–7. et al. R-spondin1, a novel intestinotrophic mitogen, ameliorates experimental colitis in mice. Gastroenterology 2007;132:1331–43. et al. Lgr5 homologues associate with Wnt receptors and mediate R-spondin signalling. Nature 2011;476:293–7. et al. R-spondins function as ligands of the orphan receptors LGR4 and LGR5 to regulate Wnt/beta-catenin signaling. Proc Natl Acad Sci USA 2011;108:11452–7. et al. De novo crypt formation and juvenile polyposis on BMP inhibition in mouse intestine. Science 2004;303:1684–6. et al. Bone morphogenetic protein 2 is expressed by, and acts upon, mature epithelial cells in the colon. Gastroenterology 2004;126:111–21. et al. BMP signaling inhibits intestinal stem cell self-renewal through suppression of Wnt-beta-catenin signaling. Nat Genet 2004;36:1117–21. et al. Smad4-mediated signaling inhibits intestinal neoplasia by inhibiting expression of beta-catenin. Gastroenterology 2012;142:562–71 e2. et al. Gene expression patterns of human colon tops and basal crypts and BMP antagonists as intestinal stem cell niche factors. Proc Natl Acad Sci USA 2007;104:15418–23. et al. Germline mutations in BMPR1A/ALK3 cause a subset of cases of juvenile polyposis syndrome and of Cowden and Bannayan-Riley-Ruvalcaba syndromes. Am J Hum Genet 2001;69:704–11. et al. Mutations in the SMAD4/DPC4 gene in juvenile polyposis. Science 1998;280:1086–8. et al. Germline mutations of the gene encoding bone morphogenetic protein receptor 1A in juvenile polyposis. Nat Genet 2001;28:184–7. et al. Long-term expansion of epithelial organoids from human colon, adenoma, adenocarcinoma, and Barrett's epithelium. Gastroenterology 2011;141:1762–72. et al. Isolation and in vitro expansion of human colonic stem cells. Nat Med 2011;17:1225–7. et al. Functional engraftment of colon epithelium expanded in vitro from a single adult Lgr5(+) stem cell. Nat Med 2012; 18:618–23. et al. Dynamic and differential regulation of NKCC1 by calcium and cAMP in the native human colonic epithelium. J Physiol 2007;582:507–24. et al. The colon-selective spasmolytic otilonium bromide inhibits muscarinic M(3) receptor-coupled calcium signals in isolated human colonic crypts. Br J Pharmacol 2002;137:1134–42. Oue N, Sentani K, Noguchi T, et al. Serum olfactomedin 4 (GW112, hGC-1) in combination with Reg IV is a highly sensitive biomarker for gastric cancer patients. Int J Cancer 2009;125:2383–92. et al. Wnt5a potentiates TGF-beta signaling to promote colonic crypt regeneration after tissue injury. Science 2012;338:108–13. et al. Single Lgr5 stem cells build crypt-villus structures in vitro without a mesenchymal niche. Nature 2009;459:262–5. et al. Cell-specific effects of insulin receptor substrate-1 deficiency on normal and IGF-I-mediated colon growth. Am J Physiol Gastrointest Liver Physiol 2007;293:G995–1003. et al. Notch signaling modulates proliferation and differentiation of intestinal crypt base columnar stem cells. Development 2012;139:488–97. et al. The Lgr5 intestinal stem cell signature: robust expression of proposed quiescent ‘+4′ cell markers. EMBO J 2012;31:3079–91. et al. OLFM4 is a robust marker for stem cells in human intestine and marks a subset of colorectal cancer cells. Gastroenterology 2009;137:15–17. et al. Paneth cells constitute the niche for Lgr5 stem cells in intestinal crypts. Nature 2011;469:415–18. et al. In situ validation of an intestinal stem cell signature in colorectal cancer. Gut 2012;62:1012–23. et al. Dll1(+) secretory progenitor cells revert to stem cells upon crypt damage. Nat Cell Biol 2012;14:1099–104.
. Microenvironmental regulation of stem cells in intestinal homeostasis and cancer. Nature 2011;474:318–26.
. Cell migration velocities in the crypts of the small intestine after cytotoxic insult are not dependent on mitotic activity. Cell Tissue Kinet 1986;19:601–10. et al. Insulin-like growth factor 1 regulates the location, stability, and transcriptional activity of beta-catenin. Proc Natl Acad Sci U S A 2000;97:12103–8. et al. Small molecule-mediated disruption of Wnt-dependent signaling in tissue regeneration and cancer. Nat Chem Biol 2009;5:100–7.
. Redundant Sources of Wnt Regulate Intestinal Stem Cells and Promote Formation of Paneth Cells. Gastroenterology 2012; 143:1518–29. et al. A basal gradient of Wnt and stem-cell number influences regional tumour distribution in human and mouse intestinal tracts. Gut 2012;62:83–93. et al. Epigenetic inactivation of SFRP genes allows constitutive WNT signaling in colorectal cancer. Nat Genet 2004;36:417–22. et al. Patterns of DNA methylation in individual colonic crypts reveal aging and cancer-related field defects in the morphologically normal mucosa. Carcinogenesis 2010;31:1158–63. et al. Smad3 contributes to positioning of proliferating cells in colonic crypts by inducing EphB receptor protein expression. Biochem Biophys Res Commun 2011;405:521–6. et al. Wnt and BMP signals control intestinal adenoma cell fates. Int J Cancer 2012;131:2242–52. AR, NW and AP contributed equally. Correction notice This article has been updated since it was published Online First. The Open Access statement has been updated. Acknowledgements The authors wish to thank Paul Thomas for bioimaging expertise, Andrew Loveday for technical assistance, Mohammad Abu-Elmagd for advice about in situ hybridisation, members of the Clark and Riley laboratories for quantitative reverse transcriptase polymerase chain reaction advice, Richard Evans-Gowing for expertise with H&E staining, and all the staff in the Gastroenterology Department and operating theatres at the Norfolk and Norwich University Hospital. Contributors Data acquisition/analysis: AR, NW, AP, EM, AS, LB, AE-H, CK, AM, NO, WY. Material support: ML, CS, WS, RW, KS, RT, CJ, JH, SK, NO, WY. Study design: MRW, AR, AP, AM. Manuscript revision: All authors. Funding: MRW, AM, AS, ML. Paper authorship: MRW. Funding The work was supported by BBSRC (BB/F015690/1, BB/D018196/1), the Boston Leukaemia and Cancer Research Fund, the Big C Appeal, the Humane Research Trust, and the John and Pamela Salter Trust. Ethics approval East of England National Research Ethics Committee. Data sharing statement Unpublished data on crypt viability after 4 days, use of the alternative ALK inhibitor SB431542, suppression of LGR5-mRNA by DKK-1, IGF-1-stimulated crypt cell proliferation are available on request to the corresponding author.